On this page, I have placed several pictures of murals done on location in Florida, Virginia, Maryland, New Jersey, Delaware, Pennsylvania and New York. I hope you enjoy them. Of course, a picture can't really replace experiencing the murals in person, so I encourage you to visit them if you can. Many of my murals are in public places. 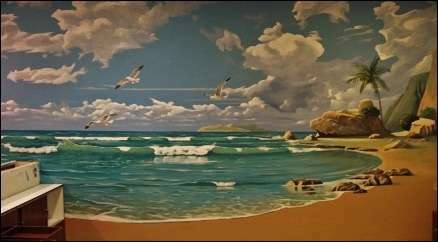 A mural is a painting done directly on the wall. It comes from the Latin word murus, which means wall. Murals often show the concerns, hopes, values and memories of the community where the murals are painted. Professional murals by Demolli Fine Art Studio are more than interior decoration flourishes. Don't commission a mural just to add value and decor to a house. 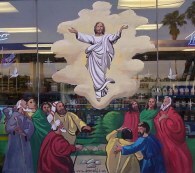 Commission a mural as an investment like any other investment..
Murals are not like other paintings. They have a different purpose, a different kind of effect on the lives of those who see them. They are public art in the best sense, because they are actually created in public, with the community looking on. Good public art says something about the community. It says, this is who we are or, this is what we think, this is where we came from, this is what we want. And it says these things in a way that everybody can understand and enjoy. Exterior murals are a special form of public art because they are actually created in public, with the community looking on. Canvas Murals are a permanent decoration, but have the flexibility of being removed in the future if needed. Bring intrigue and depth to your ceiling. Clouds, decorative motifs, and murals can be painted on the ceiling. Demolli Fine Art Studio creates murals for museums, zoos, and attractions. 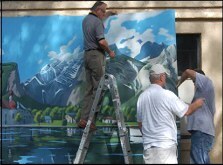 He is experienced in dramatic murals, dioramas, scenic construction, historic depictions, and thematic backdrops. Jesse Demolli works well in a fast paced, high output environment. Make a statement about your heritage, recall a favorite place, honor your hometown or its histiry. 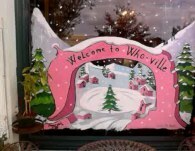 Demolli Fine Art Studio specializes in painting vistas and communities both historic and contemporary. Your child deserves the best art to celebrate his creative interests. Demolli Art Studio offers unique art work, neither stenciled nor stamped, all free hand custom designs.